The real Taddle Creek—a brief history. Taddle Creek at the University of Toronto, circa 1876. It’s such a Toronto thing to do. You take something beautiful, make it wretched, and bury it. Then, a hundred years later, recognizing both error and opportunity, you dig it up and make it bloom. Such is the history—some of it yet to unfold—of Taddle Creek, the vanished but fabled stream that once ran through midtown and downtown Toronto. No cynicism is implied here, nor any rural, pastoral yearnings or laments. Toronto has gotten along quite well without Taddle Creek, a resource that was discovered, appreciated, and carefully used by native peoples, but closer to our times ran against the flow of progress. Indeed, while the Victorians praised Taddle’s primordial beauty—University College at the University of Toronto was deliberately sited with good views of the brook, which was dammed here into a picturesque pond—they promptly polluted it. Architect-designed brick and stone mansions with parquet floors, shingled turrets, and water closets in the Annex north of Bloor Street, generated a less elegant antithesis at the less elegant end of the pipe. That these waterways continue so strongly in a big city’s stream of consciousness, long vanished but somehow known by citizenry who cannot have known them, demonstrates the power of collective memory and moisture’s tendency to persist. As recently as 1985, when Metro Police were erecting their new Gucci headquarters at College and Bay streets, Taddle Creek sprang forth in protest, from seventy feet below, demanding a change of plans.5 After crossing Bloor Street and meandering south to College Street, Taddle would have had to make a pretty abrupt easterly turn at the university to get to the site where police headquarters now stands, so it’s very likely we’re talking here about another tributary. In any case, the result had to be a shallower basement and reinforced walls, and perhaps in the future police may also be blessed with that bugaboo some Toronto homeowners must deal with due to Taddle—rising damp in the basement. Taddle Creek is perhaps most identified with, and lives on in memory most fondly, at the University of Toronto, whose campus the stream bisected between Bloor and College streets. 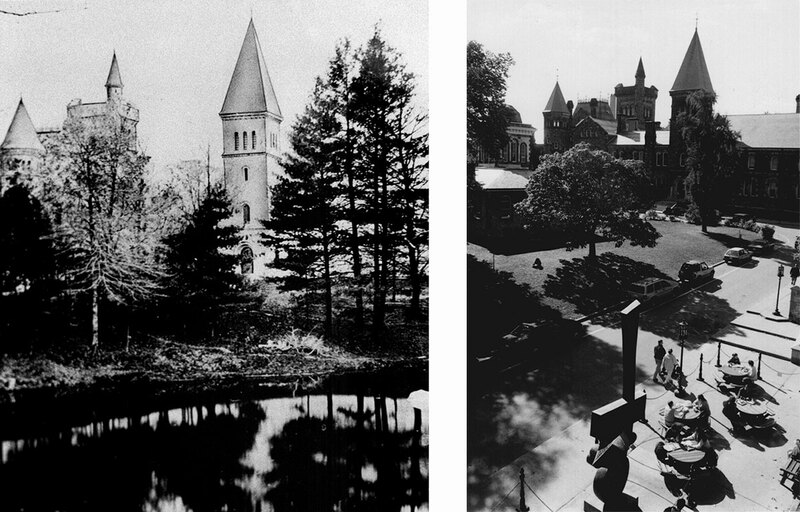 Extant photographs justify the praise, showing the stone spires of University College reflected idyllically in the waters of the little lake created when a dam was built near where Hart House now stands. So perfect does it seem that one wonders to what extent these photographs, and perhaps even the landscape itself, constitute a sophisticated public relations effort, designed to evoke just the right associations needed to sell the facility to faculty, students, and their upstanding middle- and upper-class families. 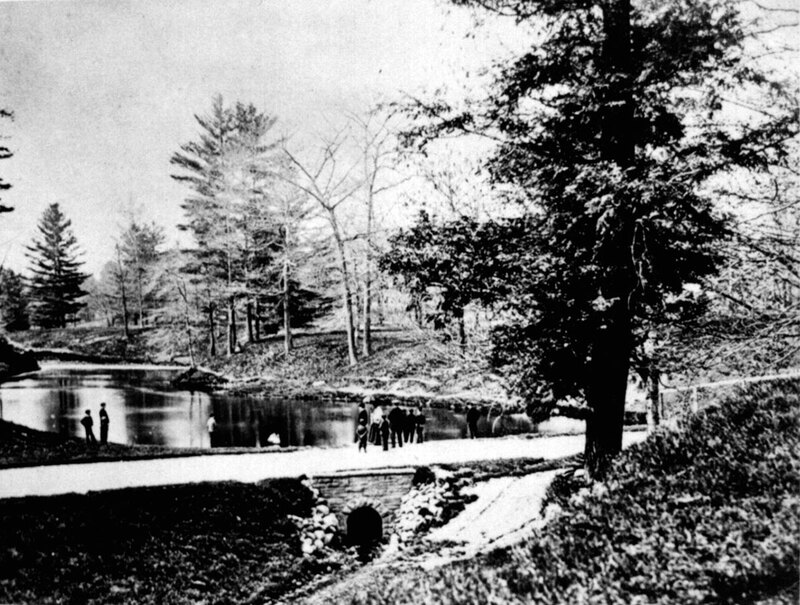 McCaul’s Pond, looking toward the east wing of University College, circa 1876...and today. The nature and scale of planned solutions, not unlike the existing problem, boggle the mind. One of the last gestures of Toronto council before the city was folded into the new megacity of Toronto was the approval of a seventy-million-dollar, four-kilometre holding tunnel, five metres in diameter, that will be bored through bedrock between Parkside Drive and the Canadian National Exhibition grounds.16 The purpose of the tunnel is to receive and store the overflow after each storm, until treatment plants catch up with the volume. It will probably work, as so much does in Toronto, but seems both grandiose and uningenious. Can this loss be repaired? Much has changed in the hundred years since Taddle Creek was buried, including thinking about sewers and pollution, cities and city life. Some time ago a study for Toronto’s Waterfront Regeneration Trust, which has been grappling with the Lake Ontario discharge problem, suggested that one answer may lie in the city’s covered creeks. Ecologists have found that natural plant and water systems, though susceptible to concentrated pollutants, also possess an amazing ability to purify water and break down chemicals and contaminants typically found in storm water with natural enzymes. One proposal for Garrison Creek in the west end would restore the waterway to its ravine with ponds designed to catch sediment, waterfalls that add oxygen, and wetlands to catch and consume nutrients considered undesirable in Lake Ontario.18 Downstream, the result would be much clearer water, and less need and pressure for more complex treatment facilities or big, costly buried pipes. Meanwhile, the by-product for the city would be, in these places, a reconciliation between the built and natural environments, which late-twentieth-century thinking has realized can not only coexist, but also support each other. Indeed, quite aside from their function, the filtering devices the uncovered streams would become would provide significantly upgraded urban parkland. The late city of Toronto left the door open, if only a crack, to such alternatives, not only by funding feasibility studies for Garrison Creek but also Taddle Creek. Partly under pressure from community groups in midtown, the city and the University of Toronto are being forced to consider the same possibility for Taddle Creek. Caught by surprise, the new megacity might find such a project politically useful, given the need to appease Toronto’s still suspicious burghers, and, compared to big pipes, more economically attractive. U. of T., something of a bully in city affairs, except when pushed and cajoled and embarrassed or bribed to be otherwise, can be expected to resist until it is time to revel in the congratulation and good public relations the achievement would bring. The tale of Taddle Creek is a story still interactive, whose ending will be shaped by the sensibilities of a new millennium. It could go either way, as Toronto is swallowed up in a much larger political landscape. The rope in the tug of war will be lengthened, extending from the Pickering border to Mississauga, and it will be interesting to see whether praise for diversity extends beyond race to intellect and aspiration. The scale of thinking may change; it will be harder to make the details matter. Suburban voters are more penny-pinching, more republican, and to them what was Toronto may seem all too foreign and threatening. Compared to the suburbs, the old city is enormously complicated and full of apparent contradictions: a city of street cleaners and street people, fancy public gardens and grubby back alleys, Bay Street suits and shirtless squeegee teens, rumbling, clanging streetcars beneath glittering skyscrapers. Digging up an old sewer would be a Toronto thing to do. But does Toronto still exist? That is the question of the hour, in this bizarre time of transition. I will be waiting, with apprehension, for proof one way or the other. I expect to find it in the waters of Taddle Creek. Lewis Mumford, The City in History (New York: Harcourt, Brace & World, 1961), 14. Jacob Spelt, Toronto (Toronto: Collier—Macmillan Canada, 1973), 6. George Gamester, “Three Forgotten Streams Run Through City’s Heart,” Toronto Star, April 17, 1995, sec. A, p. 4. David Suzuki, “How Annex’s Grassroots Seed Grew Into A Movement,” Toronto Star, Sept. 12, 1992, sec. D, p. 6. Darcy Henton, “One Less Floor For Police Station After Underground Creek Found,” Toronto Star, Nov. 7, 1985, sec. A, p. 1. Gamester, “Forgotten Streams,” sec. A, p. 4. Douglas Richardson, A Not Unsightly Building (Toronto: Mosaic Press, 1990), 76. Richardson, A Not Unsightly Building, 54. Ian Montagnes, “Taddle Tale,” Graduate, (September/October, 1979): 15. Richardson, A Not Unsightly Building, 14. W. J. Loudon, The Golden Age: Studies of Student Life, as cited by Montagnes. Richard N. Smith, The Colonel: The Life and Legend of Robert R. McCormick (New York: Houghton Mifflin Company, 1997), xi. Brian McAndrew, “Sewer Tunnel Plan $11 Million Over Budget,” Toronto Star, Oct. 4, 1997, sec. A, p. 4. McAndrew, “Sewer Tunnel,” sec. A, p. 4. John Borrows, “Buried Spirits,” University of Toronto Bulletin, March 3, 1997, p. 16. Alfred Holden, “Taddle Creek, Lost To View But Found In Memory,” University of Toronto Magazine, (Winter, 1995): 43.